The Estonian rally star Ott Tänak (Toyota Gazoo Racing) scores a hat-trick by winning the third WRC event in a row, the Rally Turkey Marmaris. 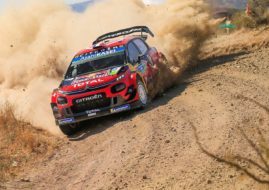 It’s his fourth win of the season in the tenth round of the 2018 WRC season. To achieve that, a driver of the #8 Toyota Yaris WRC had to survive four chaotic days at the Turkish Riviera in the most dramatic event of the season so far. Tanak himself explained that he wasn’t the fastest driver but he managed to avoid problems that reduced the field of top class drivers to half, with only five drivers entered by manufacturers finishing the rally without exiting and then returning under Super Rally rules. “This rally was so difficult. From the beginning, we knew that it will not be the fastest driver that will win this rally but that it would be the smartest. We were the most consistent and we managed to do the whole rally without any issues or having to stop on any of the stages. Obviously, it has been a great team effort and they have been able to build a very strong car. The championship is now wide open so let’s keep pushing,” Ott Tänak said. To make Toyota’s celebration even bigger, Jari-Matti Latvala finished the rally in the second place, 22.3 seconds behind Estonian. The podium has been completed by Hayden Paddon (Hyundai Motorsport). Teemu Suninen (M-Sport Ford) and Andreas Mikkelsen (Hyundai) completed the top 5 after seventeen special stages with 312 competitive kilometers. The Norwegian rally veteran Henning Solberg finished sixth overall in a Škoda Fabia R5, sharing a car with Ilka Minor. Jan Kopecky finished seventh overall and won the WRC2 category at Rally Turkey in a Škoda Fabia R5, securing the world championship title in WRC2 class. Two more WRC2 drivers Simone Tempestini (Citroen C3 R5) and Chris Ingram (Škoda Fabia R5) also secured points in the overall standings, finishing eighth and ninth respectively. The Swedish driver Emil Bergvist (Ford Fiesta R2T) took the victory in the Junior WRC category and secured the JWRC title for 2018. The reigning world champion Sebastien Ogier finished tenth in the #1 Ford Fiesta WRC after one of the most difficult rallies of his career. He was on the lead on Saturday morning but had to repair broken wishbone after SS9, getting a time-penalty and then making the fastest time on SS10. After repairing a car in the mid-day service, he made a mistake at SS11 and went off the road. He was back on Sunday under Super Rally rules to take the second place on the Power Stage and added four points to his account. The Power Stage winner was Thierry Neuville, who also had to retired on Saturday morning. He managed to earn five points to extend his championship lead. The third win in a roe propelled Tanak to the second place in the championship, thirteen points behind Neuville (177:164). Ogier is third with 154 points. The 1-2 finish also helped Toyota to take the lead in the Manufacturers’ standings.